Pictured above is the structure and roadmap for how Total Financial Network operates. Reference this diagram with the information below. 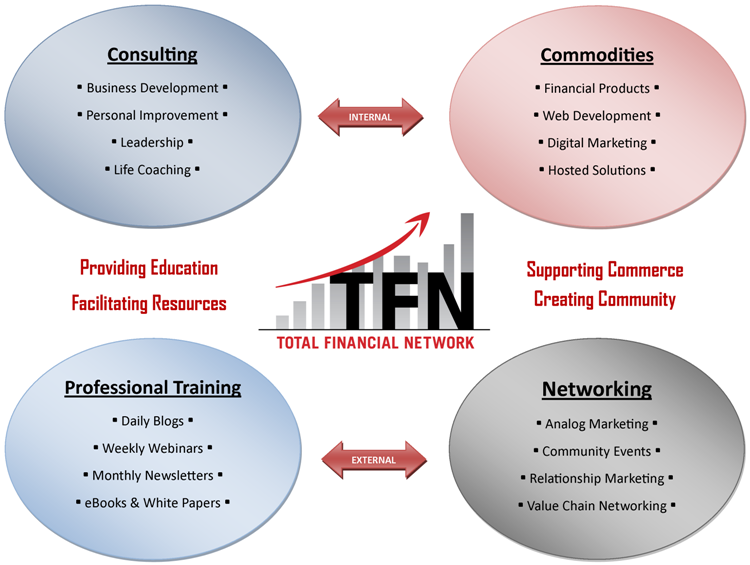 Total Financial Network (TFN) provides a value to the market like no other organization. Unlike many companies, TFN has positioned itself in-between key industries rather than directly embedded in one trend. Before understanding why this is TFN's strategic objective and how it benefits TFN's customers, it is first important to understand the two very different types of innovation that occur in business. This will serve as a framework for discussing TFN's competitive advantage in the marketplace. There are two major types of innovation in business, directional and intersectional. Directional Innovation refers to the advancement or progression of theories, products and services within a given field or industry. An example would be an auto manufacturer that comes out with a more fuel efficient type of engine. This advancement gives that manufacturer a competitive advantage, while usually temporary, and moves the entire industry one step forward. This however is a baby step forward as opposed to a massive world changing step like the invention of the automobile itself. Intersectional innovation however, requires working in-between existing industries to create a new viable solution and in some cases a whole new industry. Intersectional innovations or the emergence of new industries between existing market conditions is required for quantum leaps in business. This is what happened when Sam Walton took the idea of the high-end department store and combined it with the locality of the corner store to create Wal-Mart and the big box industry. It also happened when Ray Kroc took the idea of franchising and combined it with quickly prepared meals and the equipment to support to create McDonald's and shape the fast food industry as we know it today. TFN is an intersectional innovator that sits in-between 4 key industries. TFN's goal is to bring together the good, throw out the bad and continually strive to carve out a new way of doing business in the marketplace. With the dawn of the information age both geographic and communicative restrictions have been eliminated. The internet has leveled the playing field in business and has shaped the way humans interact on a daily basis. Out of the chaos emerge 4 key industries that from a business standpoint cannot be ignored. Rather it is business development, personal counseling, leadership training, life coaching or one of the many other niches available, consulting is a much needed resource for both business owners and individuals alike. Consultants have the expertise in a given field and ideally provide an objective, 3rd party prospective and schedule of recommendations for success. The big positive is that consults are unbiased and are not compensated when they sell something. Rather they are compensated for their time and expertise. The challenge or risk is that they can be too expensive for many people to hire. Additionally the service they provide is identifying the problems and putting together actions steps to address them. Consultants typically do not carry out the actions, leaving the customer with the task of either doing it on their own or hiring someone else as a service provider. Think of commodities as services that everyone or every business needs regardless of region or industry. A good example of this is internet service. It is not a life or death situation to not have the internet; however in today's world, not having internet access would make daily life and business transactions more difficult. Consumers accept the need for this service and typically make a purchasing decision based on price, locality or ease of use. The positive side of commodity providers is that they are supplying a much needed product or service. However commodities providers make their money only by selling or keeping the customer using the product / service. A commodity provider does not care if the customer should spend that money more wisely somewhere else, and is typically not looking at the whole picture for the customer when selling their commodity. Training and self-directed education is a multi-billion dollar industry and includes such mediums as, seminars, books, audios, webinars, blogs, newsletters, white papers, etc. Utilizing tools to help improve a given area or getting the step by step procedures are something for the "go getter" that wants to learn and do it themselves. These tools are also great reference points for individuals and business owners alike and have become one of the primary ways to get information quickly online. This industry can be somewhat elusive. Some resources are impartial and fact-based while others are very biased and basically sales collateral. It is important to ensure all the material is coming from a credible source and learners must stay open minded yet not believe everything they hear or read. Sometimes a misunderstood topic, networking is a key part of life and is sometimes how we find our next hairdresser or our next vendor for our place of business. As self-employed and small business owners know, business networking, analog marketing, referrals and relationship marketing play a key role in how to obtain and keep loyal customers. For everyone else networking is sometimes how to find the next job, next dentist, next friendship etc. In addition, people have been rubbing shoulders at community events for ages, this includes charity events, business networking groups, corporate mixers and more. Technology and specifically social media have significantly changed the way people network and interact. It has allowed, like never before, people to connect instantly and communicate efficiently across the globe. TFN has strategically positioned its value in a way that serves others rather than sells them. By combining the best elements from the 4 key industries and discarding the negative elements or downside to working with a company in one trend, TFN brings a unique value to the market. However, TFN does not do it alone and has partnered with both local vendors and national brands to bring the best value, lowest cost solutions to its customers. From a consulting standpoint, TFN delivers the unbiased recommendations and support through both one-on-one-sessions and through providing the educational tools and resources to assist its customers with their goals. For some customers a read through of the book The E-Myth Revisited can make a huge impact, for others time intensive mentoring is available. TFN provides both ends of the extreme depending on the client's needs. TFN has developed an unparalleled core competency in the realm of Digital Marketing and Web Development, and thus has created a subsidiary company, Total Marketing Network, to assist business owners of all sizes in taking on the difficult task of putting their business online. Total Marketing Network is not a media company but an advanced content delivery tool with a proprietary training system. Because Total Marketing Network is non-traditional, the costs are set way below the market (commoditized) and the revenue gap is filled in through other traditional business commodities such as financial products, hardware, software, hosting etc. For more details on this concept, see Michael Dell's 3C's below. In the realm of professional training, TFN and its subsidiary companies (Total Debt Network, Total Marketing Network, and Total Merchant Network) provides all of the elements normally found within a traditional educational and training organization. This includes regular blogs, weekly webinars, monthly newsletters as well as eBooks and White Papers. TFN also holds four (4) events a year, one of which is a seminar in January specifically designed to train business owners on relevant topics. Network is in the name and TFN not only holds four (4) community events a year designed to bring people together but also systematically brings together great service providers and potential customers. On top of that TFN also actively participates in the innovational business notion of Value Chain Networking. For more information on this topic, subscribe to our monthly newsletter and we will send your our original white paper. All of these elements, combined with TFN's internal learning culture and the support of its vendors and partners create the total package for individuals and small business owners alike. Specifically in the realm of start-up and small businesses, TFN provide a value unmatched by any in the marketplace. Seen above is Total Financial Network's adaptation of Michael Dell's ground-breaking thesis on successful business in the information age. TFN focuses on a very basic yet powerful approach to business development. Before understanding why this is TFN's business development approach and how it benefits TFN's customers, it is first important to understand the background to the fundamental building blocks. On Nov 1, '99 in Detroit, MI, Michael Dell gave a talk titled "Building a Competitive Advantage in an Internet Economy" to the Detroit Economic Club. At the time Michael Dell was in his early 30's and had built Dell Computers Inc. to a multi-billion dollar company in only 15 years. Dell laid out a simple approach to evaluating a company's sustainability in the information age. Dell made this foreshadowing comment towards the beginning of the talk,"I believe a fundamental shift in the definition of value is occurring. There used to be value around inventory; now there's value around information." He also said that, "Companies need to consider the implications of leveraging the Internet for their business. Simply establishing a web site-putting a web front-end on top of your company-is not going to create the efficiencies you need. You must re-think how you're going to use information more efficiently, and drive inefficiencies out of the system." Dell outlined that "rich" and "compelling information" must be present for a company to succeed. In today's competitive and fast-paced business environment, the content the business provides rather it be physical or not must be world class. Content, however critical it may be, is the smallest piece of the puzzle. Dell noted commerce to be thought of as all transactions. Understanding the financial basics such as accounting, inventory, COGS among other elements is essential for success. Additionally how a business leverages technology and resources to lower cost and improve efficiencies is a critical activity for business maturity. Without a well laid out commerce strategy, which puts a "score-board" on the business, the content is just a hobby. Dell summarized community as "...bringing communities together to create a network with shared interests." Creating a loyal community of customers is the most important piece of the puzzle, and with this loyal community established changes to content, commerce or the environment around the business will have a less dramatic effect on the profitability. With the power of the internet and the development of advanced tools over the last several years, it has never been more critical for businesses to focus on this. While each prospective client must bring their own world class content to the table, TFN has developed two subsidiary companies (Total Merchant Network and Total Marketing Network) to address the needs for commerce and community. While not every solution may be covered by TFN, through years of experience, TFN has identified the core areas that need attention and has either developed an internal competency in such an area or found the right vendor/partner to provide the missing piece. This delicate mix of vertical integration and outsourced services gives TFN's customers the piece of mind that TFN will work long term with that customer to achieve the desired outcomes and provide a good blend of internal and external support. Accepting payments, tracking financial data and technology integration are the critical areas that TFN has identified and created solutions surrounding. While the education source is from TFN, the heavy lifting in these departments are done by industry giants such as First Data and Trapp Online. When a TFN customer sources these commodities with TFN partners as opposed to the bank or Microsoft, they are allowing TFN to be tied to the company's success. When it comes to marketing the business and developing community, the more revenue TFN can help the business generate the greater the compensation by the partners back to TFN specifically in the realm of payment processing. This is the core element to the TFN model, when a client processes with TFN and First Data (at the same or lower cost than the competitor) TFN is now directly incentivized to help grow the client's business. For more information on Merchant Solutions & Technology Intergation please visit Total Merchant Network. As this is the most critical part of business success in the information age, TFN has internally developed the core capabilities needed to support the business and created Total Marketing Network. Total Marketing Network focuses on helping business owners build online communities using new digital tools such as social media, electronic newsletters, blogs and web development among other elements. For the business owner needing full brand management, re-branding or one-on-one sales consulting, TFN has partner with a design firm (Visual Genius Design) with years of experience in a multitude of industries. This partnership brings more resources to the table for TFN's clients and gives them an a la cart type selection of services. While traditional community building techniques and approaches must take place on-site and by the people working in the business, TFN provides the support and training to make the digital journey an easier one. For more information on building and Internet Presence & Digital Marketing please visit Total Marketing Network. With an ever changing world of technology and commodities, how does TFN stay the course and continue to develop the right solutions for its customers? One answer can be found in Peter Senge's book The Fifth Discipline. He argues that only those organizations [learning organizations] that are able to adapt quickly and effectively will be able to excel in their field or market. Another answer can be found in Charles Fine's Clockspeed. Fine notes that companies and individuals must simultaneously exploit their current capabilities while consciously and purposefully building new ones for the inevitable moment when the old ones no longer provide a competitive advantage. This is the exact culture that TFN works diligently to foster, not only in its own organization but in that of its customers as well. TFN's founders, Chris Vincent and Reed Clarke, believe that its core value is providing the education, or the information that people need but are either unwilling or unable, for many reasons, to garner on their own single handedly. By continuing to learn, change and be on the cutting edge of the most relevant and promising trends, TFN is guaranteeing security for itself and its customers, not by creating a sustainable market position but by continuing to develop its own internal abilities and the abilities of others. TFN's long term security is only assured by the many victories and success of its customers.